And another year draws to a close – as I write this there are a mere 75 minutes left of 2017. I’m really not sure where the year has gone, every year passes faster than the last, and even more so since the Apprentice arrived. Where did the year go? At my workbench (mainly working on the Policeman’s Boot Bench), and in Iowa, and at Cressing Temple. Those, I think, are the enduring mental images of 2017 – the virtual community turned into real connections with living breathing people. Good friends met, stories exchanged, and projects completed. End of Handworks dinner, Amana. Good people, good conversation, good memories. 2017 proved to be another rewarding year with plenty of opportunities to challenge myself and to progress as a woodworker. Although my output this year has only been 1 and a half projects (the Policeman’s Boot Bench, and the staked worktable) there has been plenty to learn. One of my goals this year has been to try and slow down my work pace in order to focus on execution rather than speed of a build. As I’m sure is familiar to anyone who has limited opportunities to be at their bench, over the past couple of years I have had to fight the temptation to rush work so as to complete a particular operation in one workshop session. This year I decided to try and live by the maxim slow down, its faster and ignore the ticking clock. It has paid off, and focusing on the execution of each technique has been very beneficial. 2017 was also the year when I delivered my first paying furniture commission. At times, working on the Policeman’s Boot Bench felt like wading through bottomless self doubt (can I make this to the standard the client expects? Will he be satisfied with the end product? What happens if he hates it?). All emotions which keep us honest and striving towards our best work. And you know something? While the boot bench is not perfect, the client’s response when seeing the completed piece made those moments of agony all worthwhile. That first commission was a big step, and I am looking forward to making more pieces to order. The blog readership continued to increase steadily, and I am constantly grateful to everyone who takes the time to read these posts, and to those who leave comments. For a first on the blog, I was honoured to welcome Nancy Hiller as a guest writer for a thought provoking piece on utility dovetails. 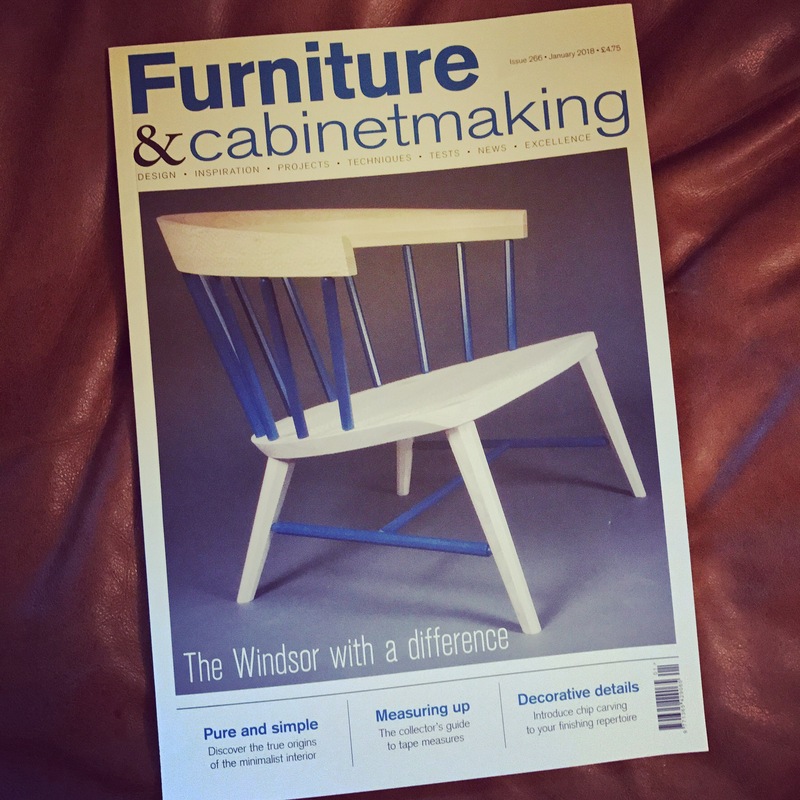 Furniture & Cabinetmaking also published nine of my articles, including my first detailed project article. This ridiculous photo sums up the defining vibe of 2017 – community. But the truly special thing about 2017 was the opportunity to connect with the wider woodworking community in person, first at Handworks and then at the final European Woodworking Show. It was wonderful to see so many old friends again, and to meet new friends for the first time. Community has been a really important part of woodwork for me over the past three years, and both events really demonstrated how vibrant and inclusive our community is. I am very much looking forward to travelling and spending more time with other woodworkers in 2018 and beyond. So what does 2018 have in store? I should know by now not to predict too much what will cross my workbench in the year ahead because unexpected opportunities and projects always arise. But I just can’t seem to help myself. The main focus at my bench is going to be completing the suite of office furniture I started this autumn. The staked worktable is getting close o being completed, and I have the matching chair and bookcase (all out of the Anarchist’s Design Book) to build so that my study/music room is fully furnished and I can decant the last two boxes of research materials onto shelves. I also have a project for Popular Woodworking which I am working on, and finally a different twist on the boot bench design for Dr Moss. There will also be more articles in Furniture & Cabinetmaking. So plenty to keep me occupied. In terms of developments away from the workbench, I am lining up some classes on interesting woodworking topics which I hope to be able to announce in 2018 for a 2019 registration – stay tuned for more details. There is also much to do on the Life and Work of John Brown. Chris Williams and I will be locking ourselves away in February to work on the chairmaking section of the book, an element of work that I am truly looking forward to. And so, with only 14 minutes left of 2017, thank you dear reader, for following along this year. Wishing everyone a bright start to 2018, I hope you’ll continue to take the journey with me.